The Independent National Electoral Commission, INEC, on Friday reversed its earlier position and admitted receiving a notice of appeal from the Abia State governor, Okezie Ikpeazu. The commission, however, said the documents it received did not contain a stay-of-execution order, to stop the issuance of a certificate of return to Uche Ogah as the next governor of the state. The electoral body had on Thursday morning issued a certificate of return to Mr. Ogah as directed by a Federal High Court in Abuja on Monday. Justice Abang Okon had ruled that Mr. Ikpeazu submitted fraudulent tax documents when he filed papers to run for governorship ticket on the platform of the Peoples Democratic Party. 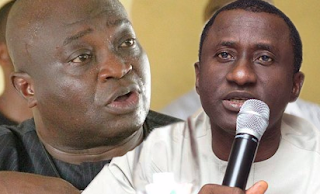 Mr. Ogah was Mr. Ikpeazu’s main challenger in the gubernatorial primaries conducted in December 2014, and had asked the court to nullify Mr. Ikpeazu’s candidacy on the basis of the tax default. Mr. Ikpeazu says he has appealed the ruling, and that he remains governor. On Thursday, INEC said it issued a certificate of return to Mr. Ogah because it had not been served Mr. Ikpeazu’s notice of appeal. After the Abia government released evidence countering that claim, the electoral body said the notice was submitted at the wrong INEC department. Documents released by the Abia government showed that Mr. Ikpeazu’s notice was received and acknowledged by Saleh Ibrahim, a senior clerical officer at the commission’s legal department, at the INEC headquarters in Abuja. On Friday, Nick Dazang, spokesman for INEC, said Mr. Ikpeazu’s failure to provide a stay-of-execution order left the commission with no choice than to issue the certificate of return to Mr. Ogah. He said since Mr. Ikpeazu’s notice was not deemed sufficient, it had to, as a matter of policy, execute the judgment of the high court. “I discovered that INEC received Mr. Ikpeazu’s notice. However, it did not contain a motion or order of stay of execution. In the circumstance, and in deference to the previous court order, INEC as a responsible regulatory (body) has no recourse than to issue Mr. Ogah the certificate of return,” Mr. Dazang said. But Abia State Attorney-General, Umeh Kalu, in an earlier statement on Thursday night, said the governor’s legal team included the notice of stay of execution order with the appeal notice delivered to INEC.